Synthetic peptide corresponding to Mouse beta 1 Adrenergic Receptor aa 394-408. Adrenergic receptors (ARs) are members of the 7-transmembrane domain G-protein-coupled receptor superfamily that bind the endogenous catecholamines epinephrine and norepinephrine. Pharmacological, structural, and molecular cloning data indicate significant heterogeneity within this receptor family. Nine receptor subtypes have been identified thus far including three alpha-1 AR subtypes (1A/D, 1B, and 1C), three alpha-2 ARs (2A, 2B, and 2C), and three beta AR subtypes (1, 2, and 3). ARs participate in either the onset or maintenance of several disease states including hypertension, cardiac dysfunction (congestive heart failure, ischemia, arrhythmias), diabetes, glaucoma, depression, and impotence. BARs participate in diverse processes including development, behavior, cardiac function, smooth muscle tone, and metabolism. In gene-knockout experiments, the majority of mice that lack the B1AR gene die prenatally and those that do survive until adulthood display abnormal cardiac function. Other studies have shown that the direct regulation of cardiac B1AR density by thyroid hormones occurs at the transcriptional level and is modulated by the catecholamine sensitive-adenylyl cyclase system. Evidence for the effects of cAMP on B1AR regulation has come from a study of members of the cAMP response element (CRE) modulator (CREM) family of transcription factors in transformed cell lines. Our Abpromise guarantee covers the use of ab3442 in the following tested applications. WB 1/1000. Detects a band of approximately 50.5 kDa (predicted molecular weight: 50 kDa). ICC/IF 1/100. Immunofluorescence staining of B1AR in mouse kidney distal tubule yields a pattern consistent with plasma membrane staining. Beta-adrenergic receptors mediate the catecholamine-induced activation of adenylate cyclase through the action of G proteins. This receptor binds epinephrine and norepinephrine with approximately equal affinity. Belongs to the G-protein coupled receptor 1 family. Adrenergic receptor subfamily. ADRB1 sub-subfamily. The PDZ domain-binding motif mediates competitive interactions with GOPC, MAGI3 and DLG4 and plays a role in subcellular location of the receptor. Cell membrane. Localized at the plasma membrane. Found in the Golgi upon GOPC overexpression. Western blot analysis of ADR-Beta-1 was performed by loading 25ug of various whole cell lysates onto a 4-20% Tris-HCl polyacrylamide gel. Proteins were transferred to a PVDF membrane and blocked with 5% Milk/TBST for at least 1 hour. Membranes were probed with ab3442 at a dilution of 1/1000 overnight at 4°C on a rocking platform. Membranes were washed in TBS-0.1%Tween 20 and probed with a goat anti-rabbit-HRP secondary antibody at a dilution of 1/20,000 for at least one hour. Membranes were washed and chemiluminescent detection performed. ab3442 at 1/100 dilution staining beta 1 Adrenergic Receptor in untreated HeLa cells by Immunocytochemistry/ Immunofluorescence. Formalin fixed cells were permeabilized with 0.1% Triton X-100 in TBS for 15 minutes at room temperature. Cells were then blocked with 5% normal goat serum for 15 minutes at room temperature. Cells were probed with a rabbit polyclonal antibody recognizing ADR-Beta-1, at a dilution of 1/100 for at least 1 hour at room temperature. Cells were washed with PBS and incubated with DyLight 488-conjugated goat-anti-rabbit secondary antibody at a dilution of 1/400 for 30 minutes at room temperature. Nuclei were stained with Hoechst 33342 dye. ab3442 staining the beta 1 Adrenergic Receptor in mouse bone marrow cells by Flow Cytometry. Cells were fixed with paraformaldehyde and permeabilized with 0.5% BSA in 2mM EDTA/PBS. The sample was incubated with the primary antibody (1/100) for 20 minutes at 4°C. An Alexa Fluor® 488-conjugated goat anti-rabbit IgG polyclonal (1/1000) was used as the secondary antibody. Immunolocalization of B1AR in mouse kidney distal tubule using ab3442. Publishing research using ab3442? Please let us know so that we can cite the reference in this datasheet. Thank you for bringing this to our attention. The two bands you are seeing might represent unphosphorylated (lower band) and fully phosphorylated (upper band) receptor but that is unlikely if the difference in sizes is 5 kDa and you are seeing just two bands. There are at least three known phosphorylation sites. There is also the possibility of glycosylation which would cause a portion of the protein to run more slowly than the unmodified portion. We have not tested this antibody against mouse brain samples, only the cell lysates listed in the caption of the western blot image on the datasheet. The result shows primarily a single band at the 50 kDa marker, and a very light band at 55 for two or three cell lysates. Other antibodies raised against the receptor, for instance ab85037, tested against mouse spinal cord, show just a single band at about 55 kDa. I suspect that one of the bands you see is unrelated to the receptor. We can send a replacement, for instance ab85307 but first I would like to see if there is something I can suggest to improve your ab3442 result. Can you please send a file of your blot image, and a few details of your protocol? In particular, how was the sample prepared? Did the prep include protease inhibitors? We have another report of a band appearing at 57 kDa only when the blot is blocked with BSA. When blocked with 5% milk, the band is not present. How did you block the membrane? Finally, what was the concentration or dilution of the antibody? Have you stained blots of these samples with any other antibodies, and were the results as expected? I look forward to your reply. I have used the antibody against b1-adrenergic receptor ab3442 in western blot on human fibroblast cell lysates and obtained a quite unspecific pattern with multiple bands but no major band at the expected molecular weight (50kDa). I have tried different things: laemmli or RIPA extraction buffers, loading different quantities of protein (10-20ug), blocking in either BSA or milk. Milk wasn’t good, showing two major bands at 36 and 38kDa, and multiple weak bands above. 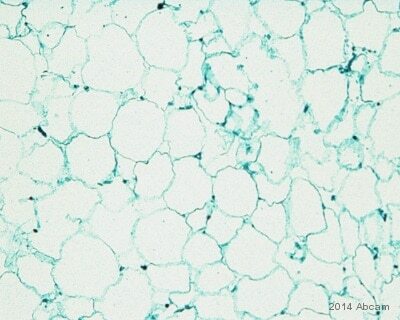 I got similar multi-band patterns with human lung and dermal fibroblasts, and human endothelial cells. I have tried to stick to a similar protocol to what is given in the datasheet, but I would be interested to know the exact conditions this antibody has been tested in, especially which lysis buffer was used, and would welcome any advice to improve the protocol. We have been using a different antibody in the past (ab77189), but the signal was very weak so I wanted to give the ab3442 a try, see if it would be better. Obsviously it’s not… One interesting thing to note is that in ab77189 datasheet, the observed band is 55-60kDa (while it’s still expected at 51kDa). Would the band I detect around 57kDa be the right one? Thank you very much for your inquiry. I apologize for the long delay of my answer. Firstly, thank you very much for having provided such a nice summary, including the data and the protocol steps. This makes it easier for us, to understand the problem. 1.) When looking at the data you provided, the first thing which comes to my mind is, whether these are not degradation products. Indeed, multitransmembrane protein are very sensitive to heat and can break. Have you heated the samples before you have loaded them on the gel? If yes, I can recommend to test also unheated samples and samples heated just for 5 or 10 minutes at 70°C. 2.) Have the samples been reduced as well? 3.) In order to avoid degradation by proteases as well, have you held the samples always on ice and added protease inhibitors to the RIPA buffer? 4.) I actually can confirm that thelysis buffer you are using (RIPA) should be suitable for membrane proteins. 5.) To my knowledge there are not isoforms described yet for this protein. If with these recommendations we do not resolve the problem, we will replace this antibody for you according to our guarantee. I am however optimistic, that not heating the samples could improve significantly the results. Please let me know how you are getting on and if you have any questions or concerns. I look forward to hear back from you. Our customer retested following your recommendation. But it still shown high background and no bands. Thank you for taking time to complete our questionnaire and for contacting us. I am sorry to hear this antibody is not providing satisfactory results. The details provided will enable us to investigate this case and will provide us with vital information for monitoring product quality. I appreciate the time you have spent in the laboratory and understand your concerns. It is regrettable the results have not been successful. I apologize for the inconvenience and am pleased to offer you a free of charge replacement, credit note, or refund in compensation. Unfortunately, we only have the same lot of ab3442 in stock at present to offer. Alternatively I can offer the antibody ab85037. This has shown to work well with mouse spinal chord tissue as well as ICC staining of SHSY5Y cells as displayed on the datasheet of this product. 1. Has the secondary antibody and Ecl reagent been used successfully in other blots? 2. Has a loading control been performed with the samples? 3. How long was the membrane exposed for? I would like to offer some suggestions to help optimize the results from ab3442. 1. When testing our antibodies, our lab uses 5% BSA as a blocking reagent, so I recommend switching to this instead of milk. For unknown reasons some antibodies give stronger, more specific signals on blots blocked with BSA instead of milk, so doing this may improve the results you are seeing, and reduce the non-specific bands. An example of the above is the western blot obtained with the Abcam GAPDH antibody ab9385 : https://www.abcam.com/gapdh-antibody-hrp-loading-control-ab9385.html#GAPDH-Primary-antibodies-ab9385-3.jpg (or use the following: https://www.abcam.com/ab9385).BSA should then also be used in the dilutionbuffer of the antibodies instead of milk. 2. I would suggest reducing the amount of protein loaded onto the gel. 20 ug of protein should be sufficient. I would also suggest heating the sample to 70°C for 10 minutes instead of boiling the sample as the target is a membrane bound protein which tend to form aggregated if boiled. 3. I would also strongly suggest performing a "no primary" control in order to deduce if this non-specificity is due to the secondary antibody or the blocking agent. Greetings- I would like to kindly ask you for sending me the list of replacements for the following antibodies: ab3546, ab12923 and ab12935. Thank you in advance for help. Thank you very much for your interest in our adrenergic Receptor antibodies. These are the alternatives we could recommend: Anti-beta 1 Adrenergic Receptor antibody (replacement for ab3546): The rabbit polyclonal ab3442 which is guaranteed to work with a number of species including mouse and rat in Western blot and Immunocytochemistry/Immunofluorescence (ICC/IF). To our knowledge, ab3442 has not been tested in Immunhistochemistry on frozen sections (IHC-Fr). Therefore, I can offer a discount off a future purchase if you buy it now, test it in IHC-Fr and submit feedback to us in the form of an Abreview. It doesn’t matter whether the Abreview is positive or negative, we would just really like to receive your feedback. The discount would be to the value of 1 free primary antibody. Please contact us again for more detailed information if you are interested. Click here (or use the following: https://www.abcam.com/index.html?datasheet=3442). Anti-alpha 1d Adrenergic Receptor antibody (replacement for ab12923): The rabbit polyclonal ab84402 which is guaranteed to work with a number of species including human in Western blot and ELISA. This antibody has not been tested in Immunhistochemistry on paraffin-embedded sections (IHC-P). Again, if you would like to test this, you are eligible for our testing discount program if the antibody has not yet been purchased. Click here (or use the following: https://www.abcam.com/index.html?datasheet=84402). 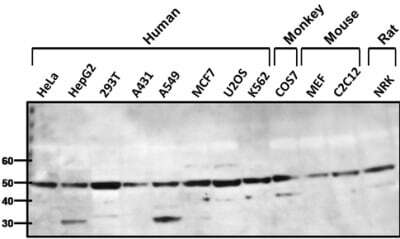 Anti-alpha 1c Adrenergic Receptor antibody (replacement for ab12935): The rabbit polyclonal ab96783 or the mouse monoclonal ab87990 which are guaranteed to work with a number of species including human in Western blot and ELISA. These antibodies have not been tested in Immunhistochemistry on paraffin-embedded sections (IHC-P) and here you are eligible for our testing discount program. Click here (or use the following: https://www.abcam.com/index.html?datasheet=96783). Click here (or use the following: https://www.abcam.com/index.html?datasheet=87990). The terms and conditions applicable to these offers can be found here: www.abcam.com/collaborationdiscount. I hope this information is helpful to you. Please do not hesitate to contact us if you need any more advice or information.